A few weeks ago, my husband surprised me. Little did I know he’d been tucking away money, but he sat me down, whipped out some cash, and told me that it was for a new VitaMix. I nearly cried, I was so excited. I ordered it right away, and it arrived at my doorstep a few days later. Of course, the first things I made with it were my morning smoothies. No real recipe there – often I toss a fruit or two, some spinach, some protein powder, and give it a whirl. But now, the smoothies are creamy. No more chewing bits of spinach! This Blueberry Spinach Mint Smoothie is even more of a delight in my new blender. Lately, I’ve been throwing fresh, ripe peaches in the blender and making creamy peachy concoctions. Delish. But the VitaMix can do so much more than just make smoothies. You can actually “cook” soup in the blender – just blend on high speed for a few minutes, and I promise you, your soup will come out creamy, smooth, and HOT! It’s amazing. But it can also blend batters for baked goods. My first attempt? 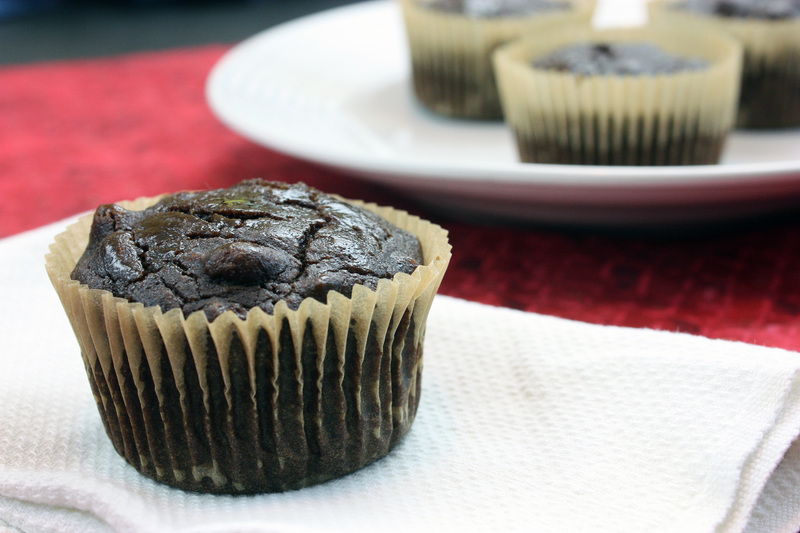 A chocolate zucchini muffin – without the addition of oils. I wanted a little treat for breakfasts that wouldn’t be too rich, too sweet, or too indulgent. This muffin definitely delivers. You’d never know there was zucchini in the batter, as the VitaMix takes care of all of those little pieces. The muffin is denser than some, but I found it really enjoyable. Just the right amount of texture for a good, hearty muffin. Preheat oven to 350 degrees. Line muffin tin with papers. Combine brown rice flour, potato starch, sorghum flour, baking soda, baking powder, cocoa powder, guar gum, salt, cinnamon, and allspice in a large bowl. Whisk until completely blended. Place egg whites, vanilla, coconut palm sugar, and zucchini into blender and secure lid. Select Variable 1, then turn machine on and quickly increase speed. Blend for 15 seconds or until everything looks uniform. Stop blender and add dry ingredients. Secure lid and continue to blend for 20 seconds or until everything is uniform. If necessary, use tamper to press any ingredients into the blades. Stop machine and pour mixture into large bowl. Mix in nuts and raisins by hand. Spoon into muffin papers 2/3 of the way full. Bake 16-20 minutes or until toothpick inserted in the center comes out clean. This post is linked to Go Ahead Honey, It’s Gluten-Free, hosted at The W.H.O.L.E. Gang. 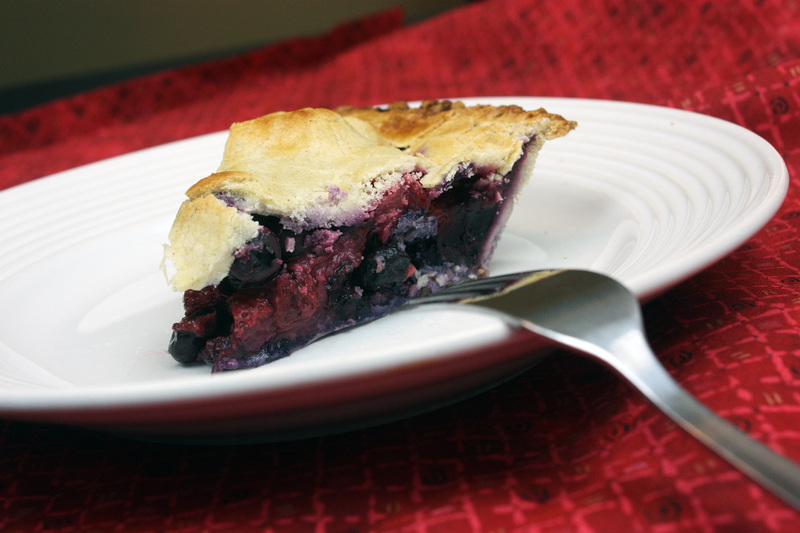 Shauna of Gluten-Free Girl and the Chef announced on Facebook a few days back that it was Pie Day on July 5. We were to have a Pie Party! Who was I to turn down that opportunity? I love pie. 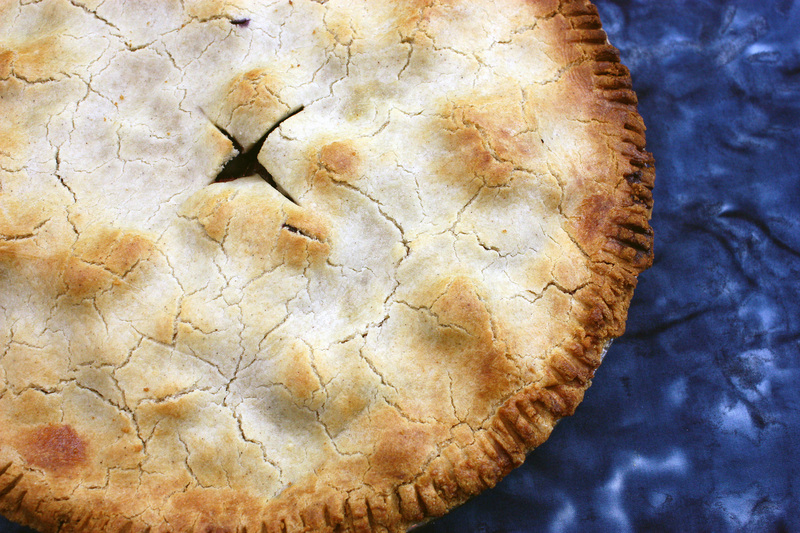 All kinds of pie – fruit pies, cream pies, pecan pies – you name it, I’m up for it. I would take pie over cake any day of the week. So I made plans to make pie this past weekend. Besides, I’ve been working to perfect my pie crust recipe, and so what better time than now? I found some amazing, deliciously ripe strawberries at the farmer’s market on Saturday. Due to the sweltering heat, however, they weren’t going to last. They were “eat-today-or-die” strawberries. I immediately took that as an opportunity to make a pie stuffed with strawberries. I opted to throw some blueberries in the filling as well, as I didn’t have enough strawberries, and besides, red and blue just seemed appropriate for the Independence Day weekend. After rolling out my pie crust, stuffing the pie with sweetened berries, and successfully topping it with a second crust (not easy to do with a fragile gluten-free crust! ), I anxiously waited while the pie bubbled away in the oven. Which also had the unfortunate side effect of heating up the kitchen – it seems that even though our house is pretty efficient, our air conditioning still can’t keep up with a 100-degree day and the oven, once 4 or 5 o’clock rolls around. It was a somewhat sweaty affair by the end. So you see, I made some pretty serious sacrifices, all in the name of pie. Once the pie cooled, we dug in. It was juicy, with a crisp, flaky crust. The verdict? Definitely tasty enough to consider a success. However, I’m still tweaking that pie crust recipe – I am considering omitting brown rice flour and using another flour next time. The crust still seems gritty in texture to me. Otherwise, I’m pretty happy with it. It rolls out nicely and with a bit of help from some egg wash, browns well. As for the filling, I think I cut the sugar back a bit too much, but it did make for a lighter dessert. Next time, however, I think another 1/4 cup of coconut palm sugar would do the trick. Regardless, I was happy to enjoy another piece the following evening. And I’m half-wishing I had a slice right about now, as a mid-morning snack. Because after all, it’s pie. Lightly beat the egg in a small bowl. Add the vinegar and agave to the egg and beat well. Pour egg mix into the flour mix and stir until just incorporated. Next, drizzle some of the water over the flour mixture and stir in, just until the dough starts to come together. Add more water as you need, but don’t make the dough too wet. It should look “shaggy”. Push the dough together with your hands and place on a large piece of plastic wrap. Shape the dough into a ball, and flatten with your hands. Wrap the plastic wrap around the dough and place in refrigerator for 45 minutes to 1 hour, or up to overnight. If it’s been several hours since your dough was placed in the refrigerator, allow it to sit out on the counter for 15-20 minutes before working it. Otherwise, place a handful of the dough between 2 sheets of plastic wrap (tape bottom piece to the counter for easy rolling) and roll out in a large circle about 1/8 inch thick. (You can store the rest in the refrigerator while you work on the dough piece by piece) If the plastic gets wrinkles in it, you can pull it up from the dough and lay it back down to keep rolling. Peel top piece of plastic wrap from dough, and un-tape the bottom piece from counter. Place 8-inch pie pan upside-down on top of dough, and lifting from underneath the bottom piece of plastic wrap, quickly flip the dough and pie pan simultaneously so that the pie crust is now laying on top of the pan, right-side up. Press the dough down into the pan, and carefully peel away the plastic wrap. Pinch away the excess pie crust. You should have enough to roll out another, slightly smaller, circle using the same technique. Combine filling ingredients together in a medium bowl. Fill bottom pie crust with filling. Place second crust on top, and crimp around edges to seal. Cut holes in center to vent. Brush crust with egg wash. Bake at 425 degrees for 35 minutes or until crust is browned and berries are bubbling. Remove from oven and allow to cool for 30 minutes before slicing. Serves 8. This post is linked to Real Food Weekly at The W.H.O.L.E. Gang. 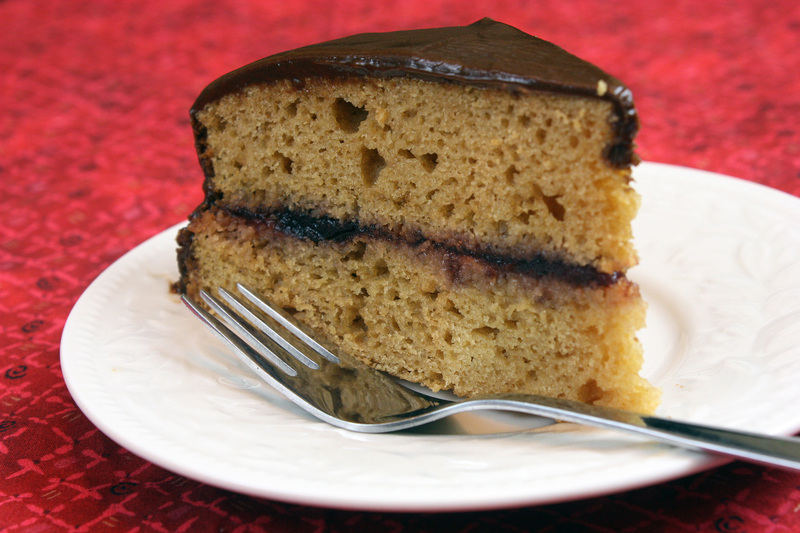 A few weeks ago, Iris over at The Daily Dietribe posted a Gluten-Free Birthday Cake challenge. My interest was immediately piqued. While birthday cake isn’t really one of my most favorite of desserts, I realize that for some, it’s practically a food group. There is a special place in Iris’s heart for birthday cake, and it’s my belief that no matter what food intolerances or allergies someone has, they should be able to enjoy those foods they love the most. For a special occasion such as a birthday, Iris ought to be able to enjoy a cake that doesn’t cause pain afterwards. I wanted to give her that cake. So I started in my kitchen, experimenting. At first I tried to bake with stevia as the only sweetener. The first cake was terribly dense, and not sweet at all. I then attempted to increase egg whites in the batter, almost like an angel food cake, but the cake ended up so rubbery and chewy it was destined for the garbage can as well. The third cake showed promise, as I incorporated coconut nectar as a sweetener, but it was still rather coarse and tough in texture. The final cake, the one I’m showing you here, was the best gluten-free, dairy-free, refined sugar-free cake I made to date. The texture was still a wee bit more coarse than a traditional white birthday cake – I used coconut palm sugar, and I believe that had something to do with it – but it tasted good. The 100% fruit black cherry jam filling and carob “buttercream” frosting sealed the deal. Four tries later, I finally had something that would truly be considered “birthday cake”. Preheat the oven to 350 degrees. Grease a 9-inch cake pan and lightly dust with gluten-free flour. In a small bowl, whisk together eggs, coconut milk, extracts, and coconut oil. (warm the coconut oil slightly, if it’s solid, by microwaving for 10 seconds in the microwave.) In a large bowl, combine the sweet white rice flour, tapioca starch, potato starch, xanthan gum, coconut palm sugar, salt, and baking powder. Mix together the wet ingredients into the dry ingredients until combined. Spoon batter into prepared cake pan. Bake for 20 minutes or until toothpick inserted in the center comes out clean. 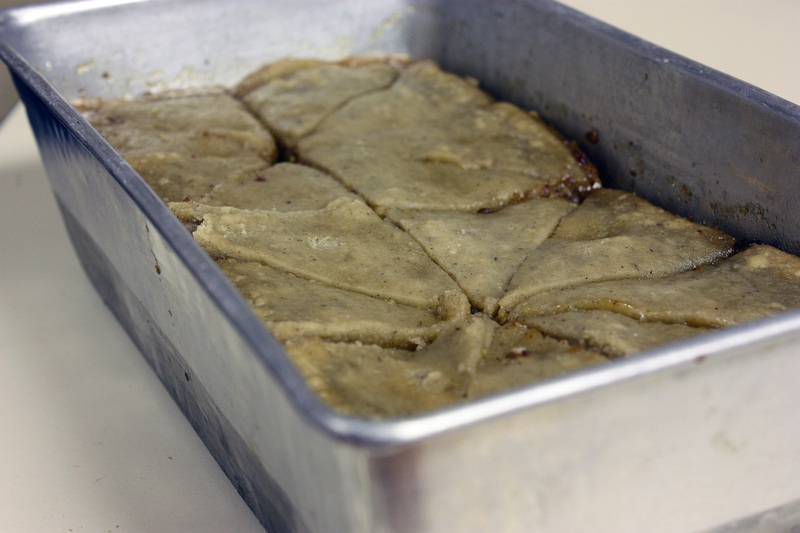 Allow to cool completely before removing from pan and frosting. In the bowl of a stand mixer, fitted with the whisk attachment, add the buttery spread, half of the powdered coconut palm sugar, the coconut milk, the vanilla, and the carob powder. Turn the mixer on medium speed and beat for 2 minutes, scraping down the sides, until well blended. Add the rest of the powdered coconut palm sugar in batches, whisking in each addition, until the frosting is stiff enough to hold its shape. Frost cake as desired. This month for Adopt A Gluten-Free Blogger I chose to adopt Cheryl of Gluten-Free Goodness. Cheryl’s a relatively new bloggy friend of mine; I “met” her through Carrie at Ginger Lemon Girl. Cheryl is a Registered Dietitian and nutritionist, as well as a health and wellness coach. She helps a lot of people enjoy a healthy, gluten-free diet. Cheryl has several food allergies, and while that might frustrate some in the kitchen, Cheryl handles it with grace and innovation. 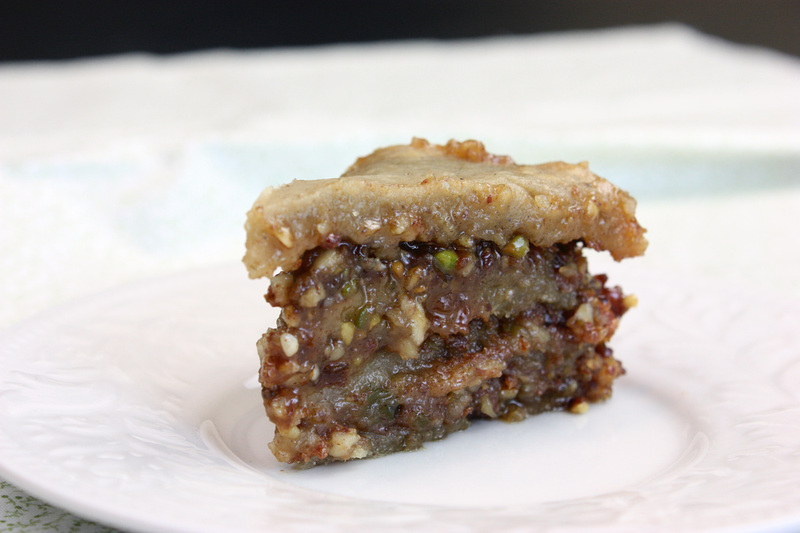 She is always coming up with something delicious, healthy, and allergen-free. It definitely makes choosing just a few recipes to try that much more difficult! Somehow, I managed. I had to choose one of her dessert recipes, and came across these amazing Brazil Nut Chip Cookies. Brazil nuts, however, are not something I adore, so I improvised a bit. (Okay, more than a little bit…but I wanted to use what was on hand. )I used almond butter instead of the brazil nut butter, substituted raisins for the chocolate chips, and used 1 whole banana instead of the avocado. My gluten-free flour blend was 1 part teff flour, 1 part millet flour, and 1 part coconut flour. 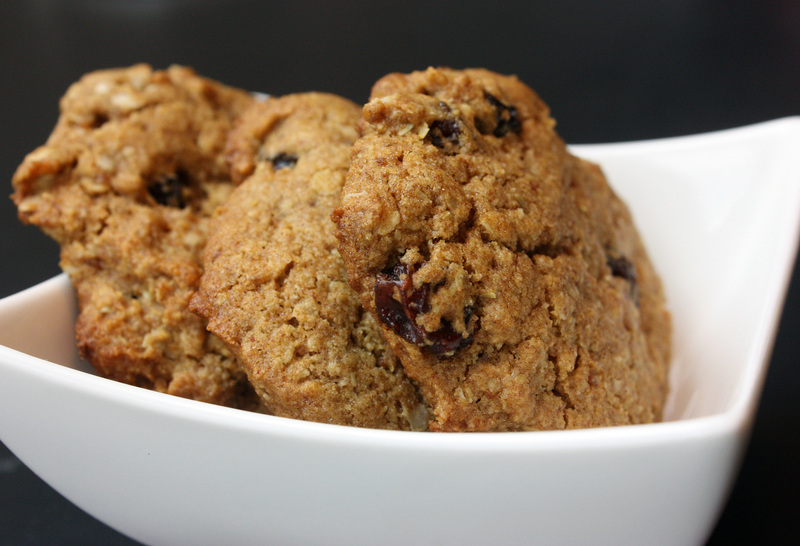 These came out of the oven tasting like banana-y oatmeal raisin cookies – one of my favorite cookies of all time. I’m definitely making these again and again. They were superb. 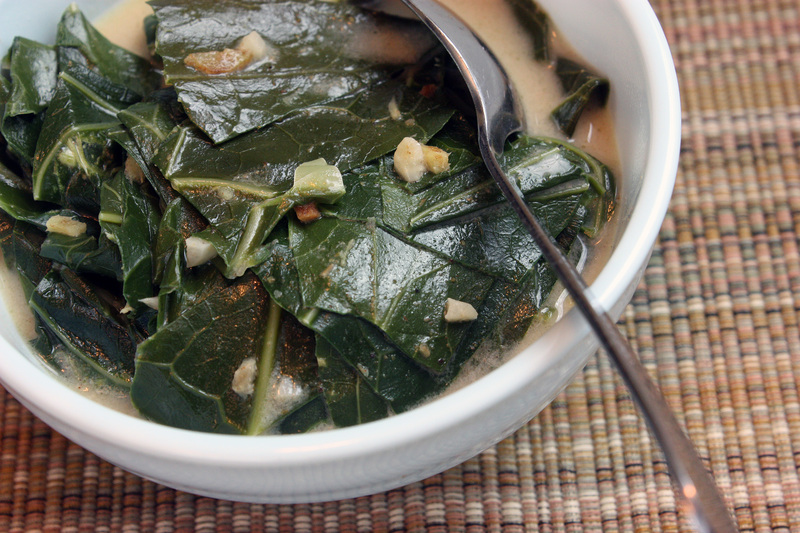 Another recipe I have tried (more than once) from Cheryl is her coconut curried greens recipe. I opted to use canned coconut milk, and did not add chicken, as I made this a side dish. Don’t be fooled by the simplicity of the ingredients here – these greens are craveably delicious. I had to make them twice – after the first time, the flavors haunted me. It’s a good thing collard greens are arriving in my CSA box in large amounts lately! While this is all I’ve made so far, I definitely found more recipes I want to make in the future. Cheryl has a Nana Skillet Bread that looks comforting and delicious. I can imagine it as tasty breakfast treat. Her Sniffle Stew looks like a go-to recipe, especially in the winter. (I don’t think you need the sniffles in order to eat it – I can imagine it’s the perfect lunchtime soup as well!) And who could pass up her Chocolate Raspberry Pie? That looks killer. Need some healthy, easy recipe inspiration? Check out more of Cheryl’s recipes here. I promise you won’t be disappointed! Think going gluten-free means resigning to cardboard-flavored, overly dry and crumbly desserts? Hardly. I take a firm stance against tasteless desserts. Only the good stuff in our household! So when my review copy of Simply…Gluten-Free Desserts by Carol Kicinski arrived on my doorstep, courtesy of St. Martin’s Press, I was ecstatic. I couldn’t wait to devour every page. When it came time to test a recipe, I couldn’t decide on just one. After all, I should be doing my best to give you a thorough review of the book, right? 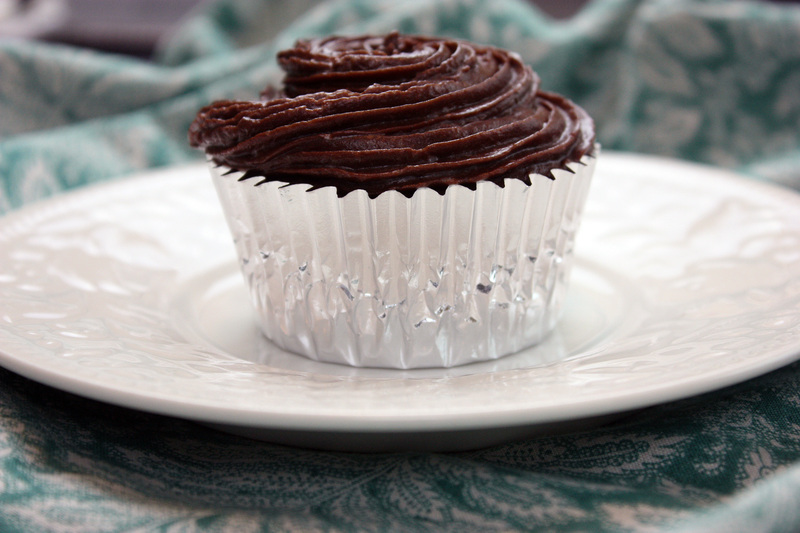 The first recipe I decided to make was her Grain-Free Chocolate Cupcakes. They seemed so simple to make, and was free of not only gluten, but also dairy and refined sugar. What was there to lose? I did opt to top it with some “buttercream” frosting (buttercream made with palm shortening instead of butter), so the end result did have sugar, but they were definitely a hit with Brittany. They weren’t overly sweet, but the cupcakes stayed moist enough and held together without crumbling – both big marks in the win column. Of course, they were chocolate – which automatically means they rank high on my “yum” list. But I cannot live on chocolate cupcakes alone. I had to do something that was a bit different. So I additionally opted to make the mango sticky rice cake. Again, it was a simple recipe calling for relatively few ingredients. I did substitute coconut sugar for the brown sugar, but otherwise followed the recipe exactly. Warm from the oven, it was sticky, creamy, with the lovely savory-sweet flavor of coconut and the sweet, fresh flavors of the mango. It’s not the flashiest cake in the world, but it definitely makes up for that with real, honest flavors. I could have eaten it for breakfast. What surprised me about this book was that there was more than just desserts. Carol also included a few muffin recipes and breakfast ideas! I am a muffin fan – I make them a lot more often than I let on here (you know, I think I should remedy that, come to think of it…). Next on my list is to make her Apple Cinnamon Muffins, which are dairy-free and refined sugar-free as well as gluten-free. They sound amazing. 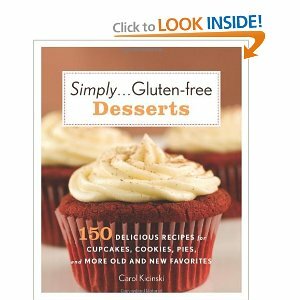 I will be giving away one copy of Simply…Gluten-Free Desserts by Carol Kicinski, courtesy of St. Martin’s Press, to one of you. The giveaway will end on Saturday, May 7, 2011. To enter, you will need to leave me a comment telling me what dessert you would love to see made gluten-free. “Like” Simply…Gluten-Free on Facebook and leave me a comment telling me you did so. 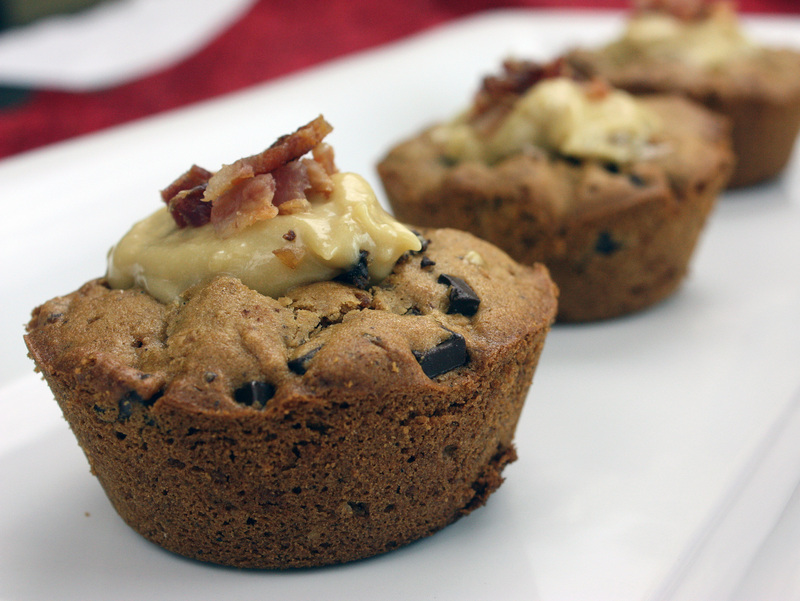 “Like” Tasty Eats At Home on Facebook and leave me a comment telling me you did so. Follow Simply…Gluten-Free on Twitter and leave me a comment telling me you did so. Follow Tasty Eats At Home on Twitter and leave me a comment telling me you did so. That’s it! I wish you the best of luck! And last, but not least, the recipe for the Mango Sticky Rice Cake. Pre-heat oven to 350 degrees. Prepare a 9 inch round cake pan by greasing the bottom and sides liberally with the butter or non-dairy substitute. Sprinkle 1 tablespoon of brown sugar over the bottom of the pan in an even layer. Lay sliced mango on top of brown sugar in a nice spiral pattern. Put rice in a large glass bowl and cover with enough water to come up about 1 inch over the top of the rice. Soak rice for at least 1 hour. Drain off water, rinse with running water and put back into bowl with 1½ cups fresh water. Cover tightly with plastic wrap. Microwave on high for 5 minutes. Stir rice thoroughly and return to microwave for another 5 minutes. Stir again. Rice should be tender, cooked through and sticky. If not, microwave for another 3 minutes and check again. Let stand covered for 5 minutes when done. Alternately you can cook the soaked rice in a rice cooker. While rice is cooking, heat coconut milk with ¼ cup brown sugar and salt until almost boiling over medium heat. Do not cook it over too high of a heat or it will curdle. Cook until all the sugar is dissolved and it is very hot. Pour hot mixture over cooked rice; stir well and let sit for at least 5 minutes. Melt 4 tablespoons butter or non-dairy substitute over medium heat with ¾ cups of brown sugar until it forms a thick caramel. Gently pour over the mango slices in the cake pan. Add rice mixture and press down to pack it well in the pan. Smooth out the top with a rubber spatula. 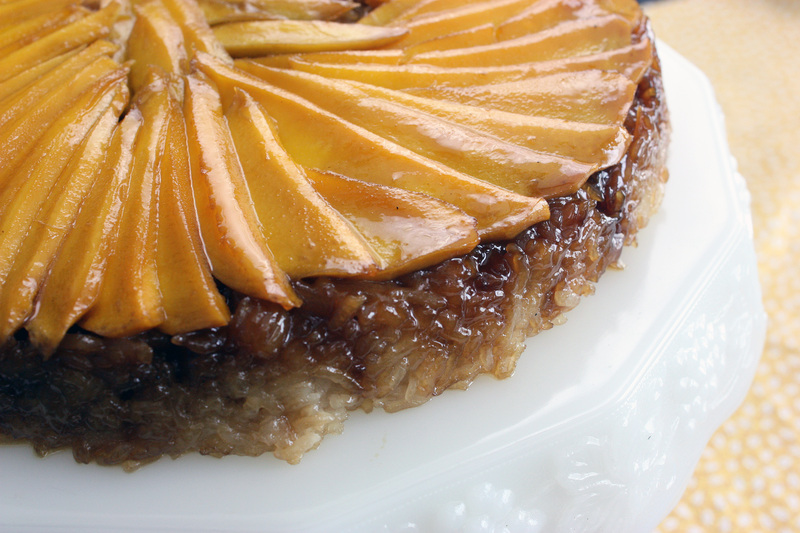 Place cake pan in a sheet pan to catch any caramel that may bubble over and bake in oven for 20 – 25 minutes or until the rice is lightly browned and the caramel is hot and bubbling. Let cool for 5 minutes and then run a knife around the pan to loosen. Invert on serving plate and let cool. The more you let it cool the easier it is to slice.